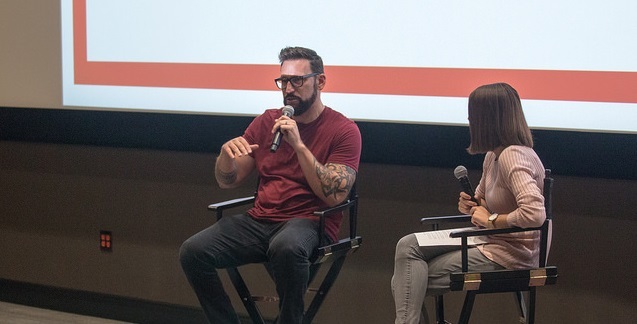 On Friday, September 29, Belmont hosted a Morris Family Mentor/Lecture Series in the Johnson Theater featuring Ric Robbins, producer and promoter for Crowd Music, owner and president of Incorporated Elements and DJ for DJ Form. Robbins shared with students his experience as a DJ and how to make the most of careers in the music industry. Robbins advised aspiring DJs to do their research, decide what kind of DJs they want to be and start working events. He said that to be a good DJ today, students should begin studying the craft and its history. Robbins shared that he learned his basis for production and DJ work while at Belmont. He said that as a producer, he likes to work with engineers because he believes in their creative mindset. He advised songwriters to learn the basics of engineering so they can do production on their own. He said that by doing so, songwriters can move faster in their careers and further their ideas. Robbins said that balancing business and creativity is challenging because the creative side is subjective, while business, by nature, objective. He said that this dichotomy lives in all pieces of the industry and that professionals must be sure not to take things personally. Robbins concluded by telling students that they have an opportunity at Belmont that most do not in other cities and to get out, meet people, collaborate with their peers and find their voice. He said that whatever students want to do, they should make the most of their time at Belmont and in Nashville. This event was moderated by Katie Braile, junior music business and marketing student.